Rainbow Road is the unlockable third Dribble Race course from the "challenges" section in the basketball game Mario Hoops 3-on-3. 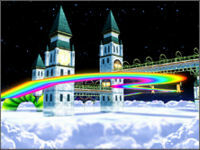 It is set in a tower-like setting above the clouds, and gets its name from the Rainbow Road-esque course that loops around the court as an aesthetic addition. Like with Bowser's Castle, its main gimmick features Lava Bubbles and colorful Bombs coming out of holes to attack the player. This page was last edited on May 30, 2018, at 22:19.